I went to Vietnam, in November of 67, at the very young age of 20 and left a year later with no holes, no bad dreams, a lifetime of memories and most of all I left a man. At times life seemed so cheap and at others so very precious. I grew up there and in doing so set the standards and character of my life. I didn't know it then but the members of the 281st and later the 192nd all had a hand in shaping that young kid. I give credit to the LORD for being with me though all that even though I was not very close to him at that time and for giving me the desire and ability to write about it now. Though I didn't know it at the time, I was very fortunate to get assigned to the 281st. As one of the first units there, lessons were learned quickly and passed all that down pilot to pilot so you generally learned from others prior mistakes and not so much your own. I was amazed at how well the pilots could fly and how they gladly passed down what they themselves were taught. From day one I felt like I was part of something special. I was passed around from one aircraft commander (AC) to another for the first few weeks. I guess it was part of the evaluation process. I was one of 8 pilots that came into the unit together. I remember flying with Skarr and Petrovich and it was with Petrovich that I got the bejeebers scared out of me in their little “combat” test (that story under “The First Hot LZ”). After I was deemed “trainable”, I settled in as George (Tommy) Condrey’s Peter pilot. I sometimes wonder if he picked me or if it was the luck of the draw. My first month in Nam didn't go very well concerning my chances for longevity. I remember asking an old W4 there what to do if a mortar attack came. He said something to the effect, “stay in bed, if its your time its your time”. I didn't hold to that at all, I was going to go down fighting. That was in my first week. The mortar attack came the second week. The new pilots were housed in the middle barracks. I remember having the upper bunk right next to the door. On the backside of the bunk someone had put up a sheet of plywood or maybe there was a wall there, I don't remember for sure. You always slept with mosquito netting. Robin Hicks, a fellow new guy who was later to become my buddy, was bedded down just down the hall. When the first few rounds fall you know it instantly even before the sirens begin. Like a flash I was up and out and on my way to the bunker between the two barracks. I never heard the explosion, I guess because it was so close and so loud my ears automatically shut down for a second or two. I remember seeing a big ball of orange, about 3 feet in diameter, on the ground to my left. Though I never heard the explosion I did hear the shrapnel whiz by. It sounded like a bunch of bees whizzing by my head at full speed, about 4”-6” away. Guess the LORD had me take that one extra step because what should have killed me ended up tearing up the top corner of the stack of sandbags that were always stacked 14 high around every sleep area building. I got to the bunker and found a few other people already there. The shells were still falling when others brought in a Special Forces officer that was only 6 feet away from that round when it hit. He was hit bad, from the waist down, and when the attack was over they took him to the aid station. The war was now real for me. Robin Hicks didn't fair so well either. A piece of shrapnel hit him right in the stomach and he spent recoup time in the Nha Trang hospital. When visiting him later I saw the SF officer. Luckily for him, he was so close to the round that it only got him from the waist down and he had not lost any limbs. As for Robin, they pulled out the piece that went in him and he was left with a 4” X 4” L-shaped scar where they went in for a look see. Robin rejoined the unit a short time later. As for that, “if its your time, its your time” stuff, I counted 7 pieces of shrapnel that had torn through my mosquito netting right where my head was. They were all wedged in the plywood so they were easy to count. I would have died if I had stayed in bed like that W4 had said. I didn't care much for him after that. Just about every day we had a ship go down to Cam Ranh Bay on an ash & trash flight and I flew Peter pilot (PP) on that for about a week. Sometimes we would fly the valley route and other times the coastal route. I remember seeing the biggest shark of my life just past the lighthouse that was on the cliffs just south of Nha Trang. The AC took the ship down close and put our shadow along side of it. It was 3 feet longer than the shadow. On some of those runs we would throw out the old ammo. Machine gun ammo had to be thrown out every 7 days because the humidity would corrode the connectors and jam the guns. Sometimes we let the door gunners used it to shot up the sharks. That let them have some fun and gave us piece of mind that the guns did work, a fact whose importance I would come to realize a short time later. On one occasion we found a huge sea turtle and shot it but instead of sinking it floated. On the way back to Nha Trang we spotted the turtle again and there was a small fishing boat several hundred yards away unaware of the turtle. We got pretty low and motioned to them to head in the direction of the turtle. They didn't get the message so we got down along the side of them and literally blew them in the direction of the turtle. They were mad at first but once they saw the turtle they became jubilant. As we were leaving they all lined up on our side of the ship and bowed to us in unison. There was some fine eating in that village that evening. I was very fortunate in that all the AC’s that I flew with were very good. To this day I believe I would feel humbled by any of them if we were to take a ship up together. In any case, I was Condrey’s to train and train he did. Though the remainder of this story deals pretty much with Condrey it could easily relate to any of the other relationships that existed between the AC’s and their PP’s. All our individual stories parallel each other I do believe. Condrey was a 6 footer with an athletic build. He always seemed to have a little smirk that told me he had something up his sleeve and I was going to be part of it and that he would spring it on me at his convenience. He was sharp and was always thinking in a circle while I could only see what was directly in front of me. If we were working a single ship mission he would have me on the controls with him and would talk me through everything he was doing. If we were doing assaults he would take the first one and give me all the rest. At first I though he was just lazy but later it dawned on me that he was cramming it in as fast as I could absorb it. He could already do it and I couldn't so the more for me the better. I later did that with my PP’s and they probably had the same initial thoughts about me. I believe Condrey had this “thing” with the Wolf Pack, our gun ship platoon. He would seem to always pick team insertion sites that would challenge them to the max. “Try and cover me on this one if you can ” seemed to be his first rule in picking an insertion site. Condrey loved hover holes. I think he felt that if Charlie said “no way a chopper is getting into here, lets cover another site”, that's the one he wanted. One insertion in particular stands out in my memory because its the only one that I ever saw him flinch in and oddly enough it wasn't due to the hole itself. Condrey had picked an insertion spot that had to be all of 200’ straight down. The very bottom of it was overgrown slightly so we were going to have to use the rope ladders to get the team to the ground. The hole itself was the size of the ship plus probably 10 feet. The only way the guns could cover us was to go up a couple of thousand feet, nose it over, kick right pedal and corkscrew straight down. He had just started in and leaves and small twigs were flying all over the place. The CC and DG were really earning their keep keeping that tail rotor clear and everyone was looking down except Condrey and me. About 20 or 30 feet down we saw it. 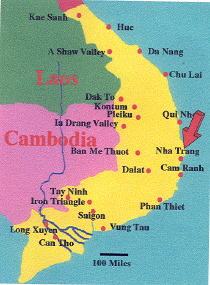 Staring us right in the face was what we first thought was an NVA. He looked so close you could shake hands with him. Out of the corner of my eye I could see Condrey do the “tee-berry” shuffle in his seat. I guess we were thinking the same thing, if he had a gun we were dead. For a split second Condrey stopped the decent. It took a couple of seconds to realize that we had apparently awakened a rather large black monkey and he was now holding on for dear life in the wind tunnel we had made of his home. For those first few seconds it sure looked like an NVA to us, sure had me fooled, Condrey too. We finally got though playing elevator and let the team out via the rope ladders. The monkey wasn't there when we cleared the hole on the way back up and believe me we were looking for him. For a split second, we had both know shear fright and that was the only time I ever saw him show any sign of fear and we got into some pretty heavy stuff together after that. I can still remember my first time going into elephant grass. Condrey took us in and as we slowly hovered down, the grass amazingly flattened out for us, the grass was probably 30 feet tall. Our down draft flattened the grass such that we had considerable blade and tail rotor clearance. The team was gone in an instant as I wondered how they got around in that stuff because just a few feet from the blades was a solid wall of grass. Condrey let me take her out of there, so straight up we went, piece-of-cake. On December 15th, now one month in country, things turned serious again when we were shot down behind enemy lines. We were #3 in line going slow and low in trail formation waiting for our turn to pick up an assault that went bad. We were hit 7 times and had the bottom of the transmission blown out which gave us all of 90 seconds to set down someplace before it froze up. #4 ship later told us 3 NVA jumped out of the tree line and emptied their AK’s at us. C&C vectored us to the only spot we could possibly be picked up in, it was behind the enemy's line and #4 followed us in. 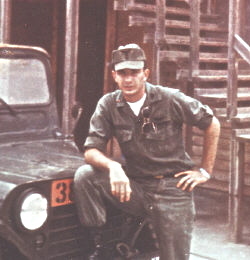 Condrey shot out the radios and secured the maps while I carried out McKenzie, our DG, who took 2 or 3 of those rounds. Condrey amazed me for he knew what to do and he set it down where there was no place to set down. Its a hell of a feeling to know your going down, to have time to think about it, and to know your life is now in your buddy's hands. The #4 ship chopped his way down to us and we all got out. When things settled down for us, I thanked the LORD that we had gotten out of there. We were put in harm's way and the 281st had come out on top again because of the teamwork, bravery and quick thinking of its men. That was on Dec 15th, on Dec 21st the guy sitting right next to me, door gunner (DG) Les Paschall, was killed. Life can be taken away in an instant. In short, I was sitting in the back of a chopper, on the flight line, with Les and a few others. A gun from another company took off the wrong way and meshed blades with the ship directly in front of us that had run up and was waiting for takeoff clearance. One of the many pieces that were flying in all directions hit Les and he died about 3 hours later. And I was sitting just 6” to his left and didn't get a scratch. There but for the grace of GOD go I. In just over 30 days I had been blown up, shot down and almost died in a senseless crash. If it weren't for the mix of the guys we had I don't know how I would have made out if left by myself. Ed “One Lung” Young hadn't earned his nickname as yet but he sure had earned his reputation. He was the company's unofficial “shrink” and could cheer up anyone. That old country boy grin and simple mentality hid a man of many wonders and definitely one that had a GOD given gift. He seemed to take special interest in me thought that's probably just the way he made everyone feel. His joking of the many incidents and perspective on the serious stuff that we ran into made it easier to deal with. In no time he would have us laughing with him. I envy the PPs that flew with him. Playing jokes on one another, somewhat like “MASH,” let off a lot of steam. One time I put a huge dead bug on Condrey’s seat while he was away from the aircraft. We had just moved into one of the dirt strips and they had tarred the strip over to keep the dust down a little. The tar had killed this huge bug that was about 8” long and it had 4” legs that were sticking straight out. Any ways it was dead but could be place upright and not tip over so on Condrey’s seat it went.. He knew it was me and made me get it out of there. He was a little peeved. Guess I hadn't earned the right to joke back yet. I'm pretty sure it was Condrey that got a good one on me in my second month. We were beginning a move to a little tent base west of Kontum that was on a little hill that was about a mile or so west of an artillery base. Our site was just going in and we were limited on ships we could put there because we didn't have sandbag revetments (kind of like a protected parking spot for the ships) for them yet. They were being made as fast as they could with the help of the local village chief and about a dozen little kids. The first night I got there I believe Condrey was already there and we only had room for two ships. I didn't care much at all for the setup because we could have easily been overrun. The artillery base gave me a little comfort but all that faded away when I saw Condrey, later that night, in a set of black pajamas that he had specially made for him. When asked about it he said if the place got over run he was heading for the tree line and hoped they would think he was one of them and wouldn't shoot. I didn't needed to hear that. To top that off the only “bunker” was a small trench, about a foot or so deep, that was right in front of the tent. As the night wore on Condrey was listening to Hanoi Hanna on his radio and kept looking at his watch. I was reading a book and getting pretty sleepy, it being close to 10:00pm. All of a sudden there was a tremendous explosion that shook the tent and there was a tremendous “Wush” in the air. I yelled “in coming” and with my helmet, gun and flack vest hit the trench. I laid in that trench, face down with hands over my head, for about a minute, before I heard the laughing. I looked up to see Condrey and everyone else in that tent standing there laughing at me. I must have been a sight, lying in that trench, in my undies. Back in the tent Condrey laughingly explained that the artillery base was given Air Force infra red reports of suspected NVA staging areas and that every 20 minutes they would send a I-know-your-there round to the various sites. They had worked out a deal with the artillery base concerning their nightly harassment fire. They were shooting the big 175’s that could fire 20 miles or more. For our benefit, they were firing the first ones over us, in order to get it over with, so we could get some sleep. They started at 10:00pm sharp, the others knew it, and I was the patsy. I think it took another half hour for my heartbeat to get back to normal. I had never hear a canon that big go off before. To me, it sounded like they filled a 55 gallon drum with concrete and shot it off and it only cleared the tent by 10 feet and was it ever loud. I heard giggles for an hour or so after that. I would like to say something here about the ships we flew. The Huey’s we had were the old “D” models which meant the engine was too small for the ship. If taking off with a full load it was the other pilot's job to monitor the gauges and read off the engine speed and transmission torque. You could only pull so much power then the engine would begin to bleed down which meant the main rotor would start slowing down which in turn meant you were going to crash if you didn't let up on things a little. Flying those under powered birds made you really sharp really fast. The story I wrote about under “Pucker Factor,” will give you a good idea of what we had to deal with at times, concerning power drain on takeoff. After I had been there several months we got the first of the new “H” models with the big engine. We were in 7th heaven. Finally we had ships with real engines. As for the maintenance on the ships, I consider that was exceptional under the conditions. There were always little things but for the most part they were well kept and that comes from someone who not only rolled one up, due to a maintenance malfunction, but who later also spent 2 years obtaining a federal airframe & power plant maintenance rating so it wouldn't happen again. One of the hardest things for a PP to learn to do was use the radios. Believe me when I say it literally took months to get the courage to begin making radio calls. I know I was deathly afraid of saying something wrong and embarrassing myself and worse yet embarrassing the 281st. I believe that almost every PP had the same problem. Add to that the fact you not only had to listen to your C&C and sister slicks, you also had to listen to the guns which were on a different channel but at a lower volume. On top of that you had the FM air-to-ground radio that kept you in touch with your team and that was set at the lowest volume level. Add to that the normal cockpit chatter and you get an idea why the radios were the last thing you mastered most of the time. When you got good and I mean real good, you could barely hear the CC and DG on their private channel. If they didn't catch you, you could switch to it and get a real good critique of what had just happened. I learned a lot listening in on private channel and rarely got caught. I was a quick learner and I don't believe Condrey had any gripes about my advancement as a pilot but there was one area that I knew I disappointed him in and that was eating. What ever was dished out I could eat it without griping. Guess that comes from being the oldest of six kids, if you didn't eat it, it was gone and there was nothing else. Any ways, the ARVN had a ration called “Fish Heads & Rice”. It had a packet of rice and a small seasoning packet that contained several spices and a bunch of small gold colored minnows. When cooked the heads broke off and floated. It didn't look to inviting and it sure didn't smell that good either but if you could get over those two the taste wasn't really that bad. To me it was a nice change of pace but to Condrey it was one step away from being a traitor. Condrey didn't like it and made me leave the tent and eat outside when ever I had it. When I came back to the tent I would make a point of licking my lips and rubbing my belly. The other ACs would give Condrey that, “Looks like you have a real winner there Condrey” look. He didn't say a thing, just shook his head in disappointment. Because of the diversity of missions and excellent AC’s from which to learn from, the group I came in with advanced quickly. We weren't just flying that ship anymore we were listening to it and feeling it as well. We were now thinking well ahead of the ship and mentally planning for anything and everything that could go wrong. Our mission verity took us all over the country and we were doing everything imaginable that a chopper could do. We had learned how to work the crew and aircraft as one and even the radio problem was now behind us. When the ACs though we were ready they would switch seats with us so we could get use to flying from that side of the ship. The lack of instrument panel on that side made for a good view out of the chin bubble. After a few hours of left seat time we were ready for our check rides. Robin Hicks was the first of our group to become AC. When I was asked I wanted it bad but had to turn it down. The numbers had worked out such that I never got any “stumps” training and that was extremely critical. 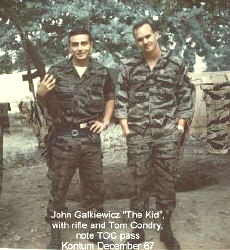 I was then sent back down to Nha Trang and joined the "Rat Pack", our other slick platoon, for a few days of training. They just happened to be doing assaults into bombed out areas and were up to their ears in stumps. For those not familiar with “stumps”, it is one of the hardest things to learn. When putting in an assault with several ships, to a bombed out area that only has craters and stumps left, you really have to be thinking ahead. You have to watch the ship ahead of you, then pick out your spot and then try to get as close to the ground as you can without punching a hole in the bottom of the ship or sticking your tail rotor into a stump. The troops are usually sitting 3 to a side with their feet on the skid, ready to jump out on the crew chief's command. They never seem to jump off together, its always one side first and that tilts the ship something fierce. You not only have to anticipate that, you also have to compensate in a split second to boot. All the while the CC and DG are clearing your tail rotor by telling you something like, 2 feet on the left, 4 feet on the right. And just as you compensate the other side jumps off and now you have to compensate even more in the opposite direction. Remember, all this has to be done with only a few feet tail rotor clearance on either side with main rotor clearance problems sometimes as well. Then, when you take off, you have to worry about not dragging a skid on a stump during a dust out and not putting the main rotor into anything. Needless to say, with the stump training out of the way, I returned to the Bandits and became an AC. The “Kid” no longer referred to my "new guy" status, it was now my official nickname and I answered to it with pride. It was a nickname McCoig gave to me when I first got there. Mac, as we called him, was the other AC that I also flew with for some variety. Just days before I made AC Mac called me the “Kid” in a different tone of voice that I instantly picked up on. He knew I was just about ready for AC status and it was his way of saying that I had finally earned my spot in his eyes. I walked with a little bit more pride in my step after that.